Whether one will like this performance will to a large extent be determined by how one judges the visual aspects of the production itself. Musically, Zubin Mehta's conducting of this score is a majestic achievement - with playing, from the great opening Prelude onwards, incisive and beautifully articulated by the Bavarian State Orchestra. The digital sound enhances the impression of opulent and sonorous strings, thrilling brass and beautifully phrased wind playing (a couple of moments of acidic oboe playing in the Prelude aside). This is not a performance that hangs fire, with speeds, particularly in the opening act, taken at a brisk tempo. Tristan is an intensely symphonic opera with complex chromatic harmonies and controlled dissonances, many of which are textually thick, almost glutinous. Some performances can sound explosive because of this. Herbert von Karajan's, for example, is perhaps the most sheerly orchestral version ever recorded, with a Berlin Phil so weighty one is almost consumed by the sound of them. Mehta certainly uses the orchestra to thrilling effect, but there is a balance to the playing that never sacrifices the span of the work's drama in favour of a lush, sonic spectacle. 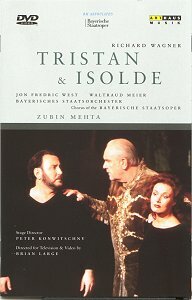 But Tristan is also an extraordinarily simple opera - with only two main characters who dominate the course of the tragedy and a small group of other characters acting at ancillaries to the story of Tristan and Isolde's progression from love to death. It is surprisingly difficult to cast - and is becoming more so nowadays with a lack of Heldontenors available to sing the taxing role of Tristan. It is a joy, therefore, to find the Tristan of the American tenor, Jon Frederic West (soon to sing the role at Covent Garden later this year), so convincing. He reminds me in many ways of the great Jon Vickers - both physically, but more importantly in his ability to thrill with a voice that is all-consuming. His presence dominates this production - and the voice is fully capable of sustaining the long scene with Kurwenal prior to his death with an ease that is impressive. This is a voice that rings with clarity - and to hear him in the love duet is just bewilderingly beautiful. Waltraud Meier is a fine Isolde, without really being a great one. She is often breathtaking, but one misses the phrasing and beauty of tone that Astrid Varnay or Birgit Nilsson brought to this role. It is a relief, however, to find that she does not force her tone - partly because Mehta creates an atmosphere of balanced textures which allows her voice to float over the most formidable orchestral fortes. She, too, has formidable staying power - her Transfiguration at the close of the opera is both powerful and noble and shows little sign of the tiredness that can affect some singers in this role. Bernd Weikl is a resplendent Kurwenal and Kurt Moll an impressive King Mark. Peter Konwitschny's production, however, presents problems, at least for this reviewer. Some will find the innocence of the staging a delight - with its ship, park and childlike simplicity. He himself believes this production gives the opera a renewed optimism - and this is certainly evident. There are moments, however, when the tragedy of the work is all but eliminated in favour of simple retelling of a love story. He does not see the opera as a metaphysical metaphor for a love that can only exist after death, rather as a means of escape from the materialism of the modern world. These lovers, do in fact, seem to inhabit a virtually empty world where even a sofa dragged on stage becomes a luxury. Compared with say, Elektra, which often seems to be produced in virtual darkness, Tristan does allow itself the extra parameters of brightness and optimism (and colours clash in this production like the loudest cymbals). I don't think this production actually draws its inspiration from Wagner's music - which is anything but simple - but from a desire to transform the overwhelming tragedy of the drama into an eternal retelling of one of the great love stories. The costumes, designed by Johannes Leiacker, do much to emphasise the simplicity of the vision. Along with the set design, one is reminded of a picture postcard world far removed from the usual settings given to this opera. This is certainly a Tristan that many could live with and it survives repeated viewing well. And, it is crucially a gripping performance. This, however, is Mehta's achievement - and he encourages his principals to produce singing that is really an exception to the modern day standard of underwhelming performance tradition.